Abeam – At right angles to the side of the ship. Ahoy – A sailor’s call to draw attention. Articles – Contract signed by pirates when signing with a ship. It stated the rules as well as shares of profits. Assizes – English Courts of justice. The judges traveled from place to place and held these courts. Black Jack – A leather tankard made stiff with a coating of tar. Used by dockside pubs and taverns to serve wine and beer. Ballast – Heavy materials at the bottom of a ship used to keep the ship upright. Blow – Short, intense gale or storm. Blunt – Slang for money. Boatswain or Bosun – The Warrant Officer in charge of sails, rigging, anchors and associated gear. Boccur (Bokor) – This term can be used in one of two ways. It can refer to a houngan who practices black magic or Petro Voodoo. Or a Voodoo practitioner who is not a priest and who does not use his powers for the benefit of others but rather for purely selfish motives. There are few, if any female boccur. Booty – Term for profits taken from plunder. Boucan – French word for a grill used to smoke meat. The word buccaneer came from boucan. Smoking meat for sale to passing ships was common from about 1620 to 1670. Men were illegally hunting and smoking the meat until the Spanish cracked down on them. Many took up pirating since their livelihood was over. These men at the time were known as Boucaniers. Bow or fore – Front of ship, Forward. Bow Street runner. Bow Street is the name of the chief police court of London. A runner is a sheriff’s messenger, or bailiff. Brethren of the Coast – The Caribbean buccaneers called themselves by this name around the 1640-1680 time period. Broadside – The simultaneous firing of all the guns on one side of a ship. Buccaneer – The Term originally applied to the hunters of wild oxen and pigs on the island of Hispaniola, but later it was used to describe the pirates and pirateers who plundered the shipping and coastal towns in the West Indies and on the coasts of South and Central America in the second half of the seventeenth century. Bulkhead – A vertical partition inside of a ship. Bumboo – A mixture of rum, water, sugar, and nutmeg. Favoured among West Indians as well as buccaneers and pirates. Calf – A small island near a larger one is sometimes called a calf. Capstan. A heavy cylinder of wood or iron, fixed upright on the deck of a vessel. It is revolved by levers, and the heavy anchors raised or lowered by ropes, or cables, wound around the capstan. Caraccas. In the eighteenth century this name designated Venezuela and some of the adjoining colonies. Careen – To heel over a ship to clean the seaweed and barnacles from her bottom. Castles – These were raised sections of ships. They came from earlier times when archers would use the raised platforms to gain an advantage over their foe. Those ships had extremely high castles. Castles were either fore ( forward ) or aft ( rear ). Cat-O’-Nine-Tails – A whip made from knotted ropes, used to punish crewmen. What was meant by being “flogged”. Caulker – To caulk a boat is to stop up its leaks, and make it fit for use. Cog �€“ An early ocean going ship. It had very high sides and a raised bow and stern. Colors – The flag flown by a vessal to show her nationality. Commissions – Governments would issue these licenses to privateers. They authorized raids on foreign shipping. Corsairs – A Pirate or Privateer operating in the Mediterranean. The most famous corsairs were those based on the Barbary Coast of North Africa who were authorized by their governments to attack the merchant shipping of the Christian countries. Crimp – a person who is tricked or press ganged into serving on a crew. Cross-trees – A crosstree is the cross-bar of wood or iron near the top of the mast. Cutlass – A short, curved, thick sword. The preferred weapon of many a buccaneer. Possibly a carry over weapon from the days of making boucan. Davy Jones’ Locker – According to sailor’s lore, Davy Jones is an evil spirit in the sea, possibly the Devil. His locker was the ocean where he received dead sailors. Dead-eye. A round, flat, wooden block, or pulley, used to extend the sails and for various purposes. Dead-lights. Slang for eyes. In nautical use it is a wooden or iron block used to close the port holes. Deck – The exposed area of the ship which the men did their work. Dirk – A long thin knife. It was used for fighting in close quarters, as well as cutting rope. Doldrums – Certain regions about the equator which have either no winds or light and uncertain ones. Doubloon (Doblon) – A gold coin minted by Spain or Spanish colonies. Dry Tortugas – A group of small coral islands in the Gulf of Mexico, southwest of. Florida. Duff – A stiff flour pudding boiled in a bag; as, plum duff. Fathom – A measure of six feet, used to describe the depth of water. Fidges – Trembles, fidgets. Generally alcohol related. Figurehead – A carved figure perched on the front or bow of sailing vessels that helped establish a ship’s identiy. This also refers to the captain when the spouse is on board. Flibustier – French term for pirates during the golden age of piracy. Fluke – The portion of an anchor that digs securely into the bottom, holding the boat in place; also, any occasion when this occurs on the first try. 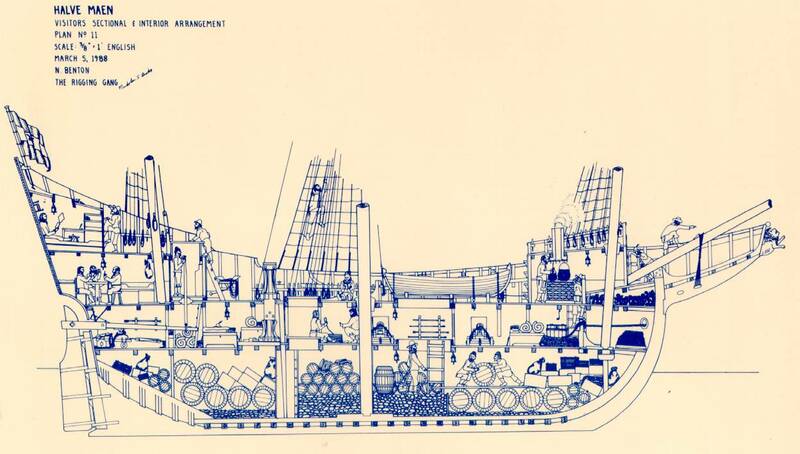 Forecastle – The forward part of the ship, where the quarters of the sailors were. Freebooter – Another term for pirate. Gallipot – A glazed earthen pot used by druggists to hold medicines. Gaskin – A kind of hempen packing-cloth. Gentlemen of fortune – A euphemism for pirates. Gibbet – A wooden frame from which dead pirates were hung, often in a metal cage especially fitted for the dead man. This was done as a warning to others who would think of taking up a career in piracy. Grog – British naval seamen received a portion of liquor every da, rum to be diluted with water. Grommet – A name British seamen gave to an apprentice sailor, or ship’s boy. The word comes from the Spanish word grumete, which has the same meaning. Gully – A sailor’s sheath-knife. Handspike – A heavy bar or lever of wood or iron, such as were used in revolving the capstan. Hatches – Covers to close openings in the deck of a ship. Houngan – A male Voodoo priest. A Houngan is a practitioner of Voodoo who uses his knowledge and power for the benefit of the community, their faithful flock and humanity in general. They have all the powers and abilities of a Boccur but a Houngan’s motivations are not selfish but are driven by the needs of the many. Houngan find it easier to summon and work with Rada Loa then Boccurs do. Hawser. Rope used in warping the vessel. Hulk. A shipwrecked and stranded vessel. Jack (or Jack Tar) – a common nickname for sailors. Jolly Roger – The Jolly Roger was the pirate’s flag. It had a black background and a symbol (usually white) symbolizing death. The jolly roger came into use about 1700. Before then pirates used the colors of their nationality. Only Edward England flew a flag with the true skull and crossbones motif, but all those flying the Jolly roger had symbols signifying either death, violence or limited time. The variations were unlimited. Keel – Lowest lengthwise running timber of ship. Keel-hauling – A method of punishment in the English navy. The culprit was drawn by ropes through the water from one side of the ship to the other by way of the keel or bottom of the ship. Keelson – The keelson is the heavy timber placed along the keel, or bottom, of the ship, to strengthen it. Land Ho! – Traditional calling when a sailor sights land. Lee shore. A shore beaten upon by the wind. Lipping – When part of the deck is dipping under water a little. Lubber – Lubber is an old slang word for someone who is stupid and lazy. Sailors added land to it to describe someone stupid about the ways of life aboard a ship. Lugger – A sailing vessel of two or three masts, so called from the manner in which the sails are hung. Mambo – A female Voodoo priest. A Mambo is a practitioner of Voodoo who uses her knowledge and power for the benefit of the community, their faithful flock and humanity in general. They have all the powers and abilities of a Boccur but a Mambo’s motivations are not selfish but are driven by the needs of the many. Mambo find it easier to summon and work with Rada Loa then Boccurs do. Maroon – Pirates used marooning as an act of punishment. A transgressor of their codes would be stripped and left upon an isolated island with only a few supplies, if any at all. Most transgressors preferred a quick death to marooning, for it could mean starvation or worse, isolation for years, until rescue or death. Marooner – Marooners were yet another breed of pirate harassing the Spanish Main. Marooner is a coruption of the Spanish word “cimarrona” which loosely translates to “deserter” or runaway. One group of marooners were the Cimmaron Negros. These were the runaway slaves that had been brought to the Americas by Spain to haul the heavy cargos of gold and silver. The cimarronas quickly joined with the other deserters and runaways and became known as Marooners. Mast – These were upright beams which sails were suspended from. The number of mast varied. Their names were, mainmast ( largest mast centrally located ), fore-mast ( front of ship ), aft-mast ( rear of mainmast ), mizzenmast ( usually lateen-rigged, rear and sometimes front of ship, used to improve steering ), bowsprit ( extended out at an angle over the bow ). Mate – The word mate comes from the word meat, and originally meant people who shared food. Later it came to be known as a companion. Mate was also the title of an officer aboard naval and merchant ships. The mate oversaw the sailors, ensuring that the captain’s orders were carried out. He also was responsible for stowing cargo and organizing the crew’s work. Moidores – A Portuguese gold coin. No Purchase, No Pay – A term used to mean “no plunder, no pay”. At the time, the English word purchase referred to any plunder, loot, or booty. A pirate sailing under this term ( in the ship’s articles ) would have to seize loot or forfeit pay. Old Bailey – The principal criminal court of England, situated in Old Bailey Street, London. Painter – The rope at the prow of a boat. Palm Key – An island just off the west coast of Florida. Peg Leg – This was a nickname, given by pirates to those who had replaced a leg with a wooden prosthetic. The Spanish name is Pieacute; de Palo, the Dutch is Houtebeen. Peso ( Piece of Eight ) – Silver Spanish coin. The peso was the main coin in the Spanish-American colonies. It was slightly larger than the 19th century U.S. silver dollar. It had a value of eight reales. Often the coin would be cut into 8 sections, each one representing 1 reale. Hence the name “piece of eight”. The Spanish government minted an immense amount of these coins and they were widely circulated. Picaroon – Term meaning both pirate and slaver. Point nearer the wind – To sail almost against the wind, with the angle between the wind and her course very small. Ponton – An English prison hulk, or converted ship hull where captured pirates were held. Poppet – any of the vertical timbers bracing the bow or stern of a vessel about to be launched. Port – Left side of a ship. Privateer – An armed vessel or persons aboard, which are authorized by a commission or “letter of marque” from a government to capture the merchant vessels of an enemy nation. Prize – A prize was a ship which was captured. The word is derived from the latin pretium, meaning prize, value, reward, wages. Quarterdeck – As the need for castles was diminished so too was their size. Fore and aft-castles were replaced with the terms quarter-deck and fore-deck. Quartermaster – Under pirates, the quartermaster had an almost equal amount of authority as the captain. He was elected and as such was the crew’s voice. If a ship was captured, the quartermaster almost always took over the captured ship. He maintained order, settled arguments, and distributed supplies. The quartermaster was in charge of all booty gained and distributed it among the crew. Royal George – a common name for English inns. Sailing – The fine art of getting wet and becoming ill, while slowly going nowhere at great expense. Scuppers – holes pierced in deck near bulwarks to allow surplus water to drain off. Sea Rover – A pirate or pirate’s ship. Sequins – An Italian gold coin worth about two and a half dollars. Shake out a reef – Let out more sail, get under way. Sheeted home – Sails spread to the full extent. Stern or aft – Rear of ship. Strike the Colors – to haul down a ship’s flag as a signal of surrender. Supercargo – An officer on a merchant vessel whose business it is to sell and purchase the cargoes or freight. Sweet trade – the career of piracy. Swab – A swab is a mop made from rope used to clean the deck. It is also an insult intended to show contempt for a crude, ignorant person. Tarpaulins – A slang name for sailors. The Trades – That is, the trade winds, which blow constantly in the same direction during certain seasons of the year. Thwart – A piece of timber across the frame of a boat. Wain – An old name for wagon. Warped – Moved forward by throwing a rope over some object and hauling the ship up to it.